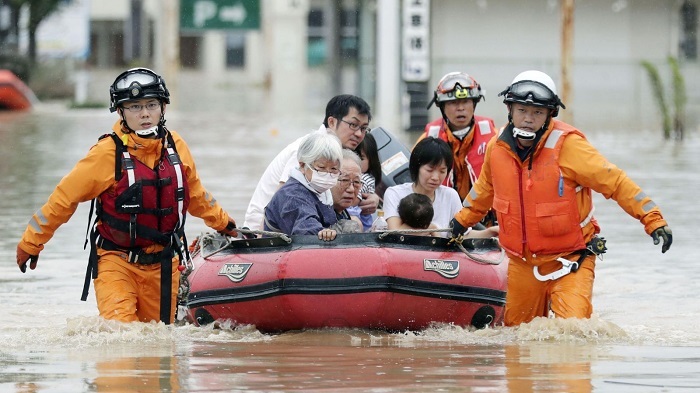 In Japan, 64 persons lost their lives in extreme weather which flooded the central and western part of the country. More than two million people were ordered to evacuate their homes following heavy rainfalls. It was reported that water level reached 4.9 metres in the most hit areas. Many Japanese citizens waited for assistance on the roofs of their residents, while others recurred to Twitter to attract attention for their rescue. Around 44 other persons are still reported missing. At the same time that rescue workers are saving many people from imminent danger, Tokyo was also hit by an earthquake measuring 6 on the Richter scale. Fortunately no tsunami alert was issued by authorities and no damages to buildings were reported.